New, from Pierre V. Comtois and Sons of Liberty Publishers! Real Heroes, Real Battles: The Men Who Won America’s Wars includes all of the author’s hard to find non-fiction articles covering America’s heroic past up till now available only in out of print magazines such as Military History, World War II, and America’s Civil War. Collected here for the first time, the reader will meet such unforgettable personalities as Gen. John Stark victor at the Battle of Bennington; legendary Texas Rangers Rip Ford and John “Devil Jack” Hayes; and many others! 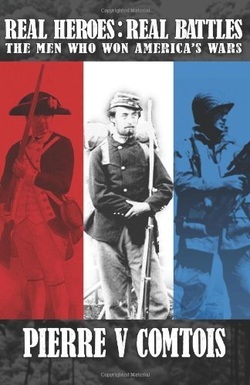 Thrill to great battles of the American Civil War including Honey Springs, Sabine Crossroads, and Brownsville and World War II battles in both the European and Pacific theaters including those of La Fiere, Port Lyautay, Kerama Retto, and the liberation of Manila. See history come alive in these authoritative yet entertaining page turners celebrating America’s past! In addition to a generous helping of illustrations, Real Heroes, Real Battles will also feature maps and diagrams detailing all the action of the various battles described!